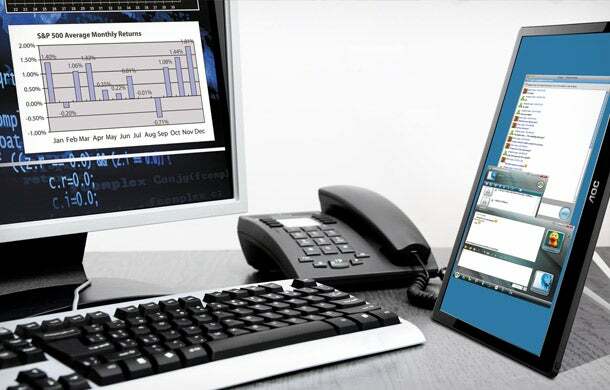 AOC's portable USB monitor offered our tester multi-screen capability while on the go. The grab-and-go convenience of a laptop-only worklife has worked for me for years--but that doesn't mean I'm willing to sacrifice screen space. At my home office, I plug into a 22-inch LED monitor as my primary screen, leaving the laptop reserved for Evernote and email. But my 22 incher from Viewsonic is about as portable as the print edition of the Oxford English Dictionary. So when I do work at coffee shop tables, picnic benches, friends' offices, wherever, I feel hemmed in by my 15-inch laptop screen. I can get two windows open side by side but ... it's tight. And that means I'm constantly searching for layers-back windows I opened three hours earlier. (Oh, stop tsking. You know you do this, too.) When I learned that AOC made a USB monitor that could help me multi-screen while on the go, I couldn't resist putting it to the test. The product's promise: The AOC E1659F LCD USB Monitor is designed to be a portable, lightweight, plug-and-play monitor. The 16" screen stands either horizontally or vertically, for on-the-go setups. You connect the monitor to your computer with the included USB Monitor 3.0 cable and you're off and working, no power cord necessary. It even comes with a cushy fabric case to keep it safe in your computer bag or backpack. A few minor issues, such as windows that resized too large for our tester, weren't enough to keep our writer from wanting this portable monitor from AOC for herself. Our reality: Aside from the clunky name--come on, tech manufacturers, use your words!-- the AOC blah blah blah gets a serious thumbs up from me. After downloading the drivers to get it humming, it worked exactly as promised. The unit even caught the eye of some of the programmers who hang out at my co-working space. It's like the puppy of the monitor world; everybody wants to pick it up and say nice things about it. Costing a relatively reasonable $129.99, the plastic-framed screen weighs just 2 lb. 11 oz so it didn't up the shoulder pain on the days I toted it around with my weighty MacBook Pro dinosaur. I did have some minor issues. Unlike my home setup, I don't use the AOC as my primary monitor while on the road. Instead, it takes the role of right-hand man, playing host to my to-do list and email and all that sort of thing. Why? You can't change the resolution on the monitor so when you drag a window over to it from the laptop screen, it automatically fills the screen. I don't always like my windows THAT BIG so I end up futzing with them to resize them. But that's just a personal preference thing. The company spokeswoman said that behavior is "just like a regular (VGA/DVI) monitor connected to a PC." I haven't found that with other external monitors but ... I also haven't tested a ton of them. And, really, it wasn't that big of an issue once I got used to it. The only other wonky thing was that, at times, my cursor got a little jumpy on the AOC screen. It didn't roll across as much as skitter. AOC's spokeswoman says USB monitor performance is directly linked to a laptop system's speed and she recommended that I open up hard drive space, remove old cached or temporary files, and generally make sure all my programs and drivers are up to date. OK. One day. (Probably not.) But, for now, I just plugged the AOC into my much newer, much emptier MacBook Air to see how it rolled and ... success. So, it wasn't them, it was me. And it will be you because ... let's face it, cleaning out your computer files is a giant pain in the kahoozits. So, yes, a thumbs up. Now that my time with the review unit is up, I'm even planning on ordering one of my own.